Introduction: So often when you are fishing it is easy to lose track of time. The new revamped Hogwild Snap Watch is a "go anywhere" tubular watch that is designed to be reliable and durable, but affordable enough so that if lost it won't break the bank. Sizes available Small 6.5", Medium 7.5", Large 8.5"
Impressions: The SWII (Snap Watch II) is definitely a product designed for minimalists. Anglers that require lots of features like tide tables, altimeters, and fish predictors will want to stay away from this product. The SWII is designed to be ultra lightweight and durable and yet flexible enough for sports ranging from alpine climbing to fishing. The SWII basically consists of a barrel watch with two snap buttons on each side which attach to a band consisting of 4mm climbing rope. The Original Snap Watch: The SWII is a big improvement over last years Snap Watch. Hogwild's first product sported the same design but came up short in the flexibility department. The original barrel was thinner and easier to damage, but the biggest downfall of the original product was the lack of waterproofing. The watch seemed perfect for anglers, but once dipped in the water the watch would short out. The SWII features a new design that attempts to address the shortfalls of the original. Features: The SWII is slightly more stylish then the original watch and features a decorated barrel. The larger barrel not only is more attractive but serves as insulation from shock to the watch's core. The watch attaches with the click of a button on each side of the barrel. This button design allows you to switch ropes (available separately from Hogwild), chain them together, or attach to another zipper pull attachment (also sold separately). Doing this makes it possible to wear the watch around your neck, ankle, or on your jacket's zipper. Built for the simple function of telling time this watch is devoid of any advanced features or gadgetry. Instead the SWII focuses on being extremely lightweight and durable, all at a price under 10 dollars. Operation: The SWII has two buttons on the back of the barrel, one to set time and the other a mode button. 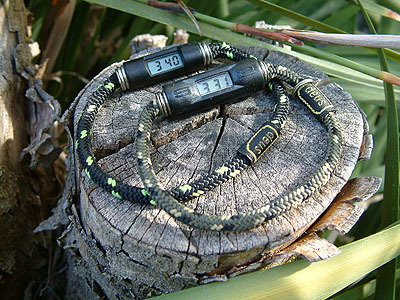 The mode button allows anglers to access a month and date. The problem is this button is recessed and is quite a challenge to push. Impossible to push without a sharp object like a pen or hook this mode button definitely needs some improvement. 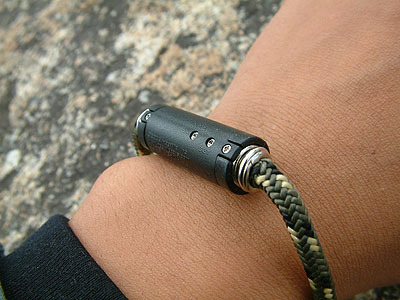 Durability: The SWII's durability is much better then the original version, and is now fully waterproof. 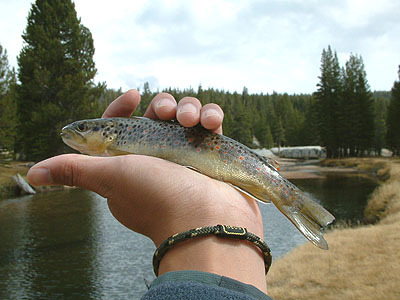 Anglers can lip and release fish without worrying about water damaging your watch. In our tests we submerged the SWII under water for over 8 hours and the watch continued to operate normally. The new design features a reinforced barrel that is sealed much better with the help of two screws on the back plate. The plastic is thick and durable and the only vulnerable area to shock, the digital time display, is recessed 2mm below the top of the barrel to prevent direct contact with surfaces. Overall the watch is very durable, and even if you dropped it on a rock and stepped on it, the watch would still function just fine. One problem we encountered was that it was possible to un-snap and lose the SWII if the rope is accidentally snagged on a branch or rock while moving. Because the watch is so light it is possible to lose the watch without realizing it until later. 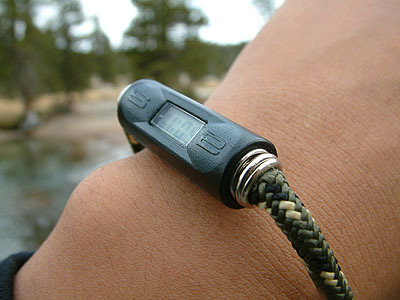 Applications: We have all lost or damaged expensive watches while hiking, camping, and fishing. The SWII tells time just as well as any expensive watch, and it is a lot easier to accept a damaged or lost SWII then your primary timepiece. In addition the SWII is lightweight and flexible enough to wear or attach to your gear for backpacking fishing trips where every ounce counts. The light weight of the watch makes it possible for anglers to cast conventional gear or strip line fly-fishing without feeling any additional weight on your wrist. Maintenance and Warranty: The SWII uses a standard watch battery that can be accessed via two screws. After removing the backplate anglers should be very careful to tighten the screws all the way to make sure that the watch remains waterproof. If the watch ever fails for any reasons Hogwild offers a "no questions asked" warranty for a period of 2 years after the purchase date...so you don't need to worry about banging up, scratching, and submerging this watch while fishing! Conclusion: Designed for minimalists the SWII is a simple watch that is a big improvement over the original version. Every time the watch is scratched or lost you can imagine that damage could have been done to your expensive primary timepiece...and the SWII accomplished its mission. Built to be lightweight and durable we were happy to see proper implementation of shock proofing and waterproofing, making it finally possible for anglers to fully utilize this watch. Not without flaws, the SWII is a good solution for the sole purpose of telling time, those that require more information and features from a watch will definitely want to look elsewhere.